The unique snap-lock chain-link design allows any length of chain to be made up in a few seconds without special links or tools. Good strength-to-weight ratio: Running Tension up to 9N (2.0lbs). Material: Acetal (good resistance to chemicals and solvents, doesn't corrode or need lubrication). 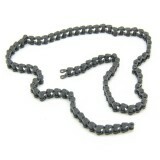 The chain is sold per foot (305mm). Light Power Transmission, Plastic Chain. The unit for this part is feet ..